TAIPEI—Chinese bombers and warships conducted drills around Taiwan on April 15, the latest military maneuvers near the self-ruled island that a senior U.S. official denounced as “coercion” and a threat to stability in the region. China has stepped up pressure on Taiwan, whose President Tsai Ing-wen is suspected by Beijing of pushing for the island’s formal independence, a red line for China which has never renounced the use of force to bring Taiwan under its control. “Any attempt to influence Taiwan through threats or coercion, we believe, destabilizes the region and threatens stability in the Taiwan Strait,” James Moriarty, chairman of the American Institute in Taiwan, said at a ceremony to mark the last four decades of U.S.–Taiwan relations. China’s People’s Liberation Army said its warships, bombers and reconnaissance aircraft conducted “necessary drills” around Taiwan on April 15, though it described them as routine. 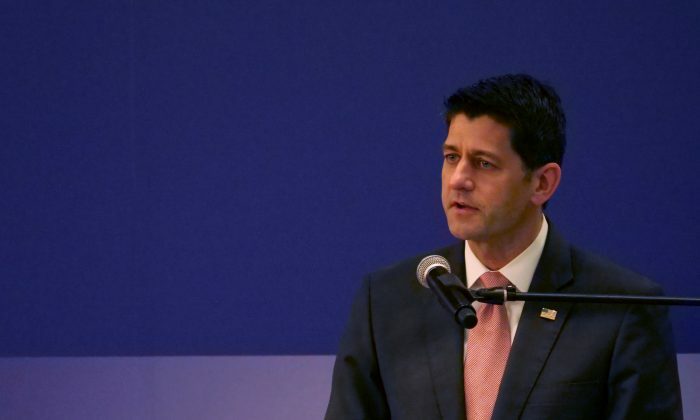 A delegation led by former U.S. Speaker of the House of Representatives, Paul Ryan, was in Taipei to mark 40 years since the signing of the Taiwan Relations Act, which governs U.S.–Taiwan relations, and to reaffirm Washington’s commitment.